Comments: A broadleaf evergreen tree native to Victoria and New South Wales in Australia. Large broad lanceolate shiny green leaves, creamy white flowers, and multiple seedpods (gumnuts) on the same short stalk. Texture of bark is rough. This specimen is only a few years old. Mature trees to 120' or more. 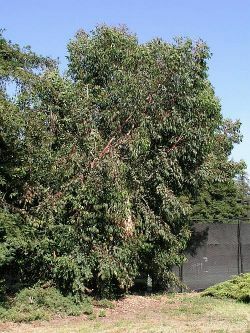 This tree has been tentatively identified as E. botryoides.